Listen to Pete talk about his new book to Owain Bennallack on the Motley Fool MoneyTalk podcast. Two bloggers today have picked up on the problems with the GDP deflator highlighted in the book in Chapter 9. Merryn Somerset Webb at MoneyWeek. I have added more information about the reasons for the discrepancy to both blogs in explanation. You can read my comments here. Moneyweek say: ‘an interesting book that asks some provocative questions’. Pete Comley ‘ has a knack for making points that others have overlooked‘. The Inflation Tax book currently dominates the the home page of Saveoursavers.co.uk. The related blog post shows that things have now changed with regard to inflation in the UK in the last few years. It is now a real danger to people in a way it was not before. Read the full post here. 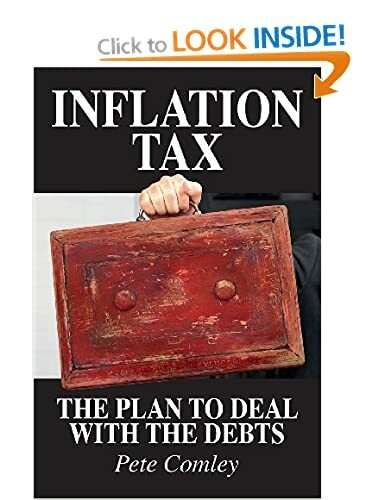 Inflation Tax is No 1 in the Inflation category, No 8 in Economics and No 3 across all personal finance on Amazon today. Pete highlights the three main options the country has to deal with the debts (Chapter 14) in a letter to the Editor of The Times on 19 July 2013.